No cinnamon rolls but stomachs full and back on Cherry Red to continue our drive to the hike. Can you see the moon roof? In my opinion one of the best things this car had. No cinnamon rolls but still smiling. Did I say it was wet? Well, let me say it again. It was wet wet wet (that means wet x3). 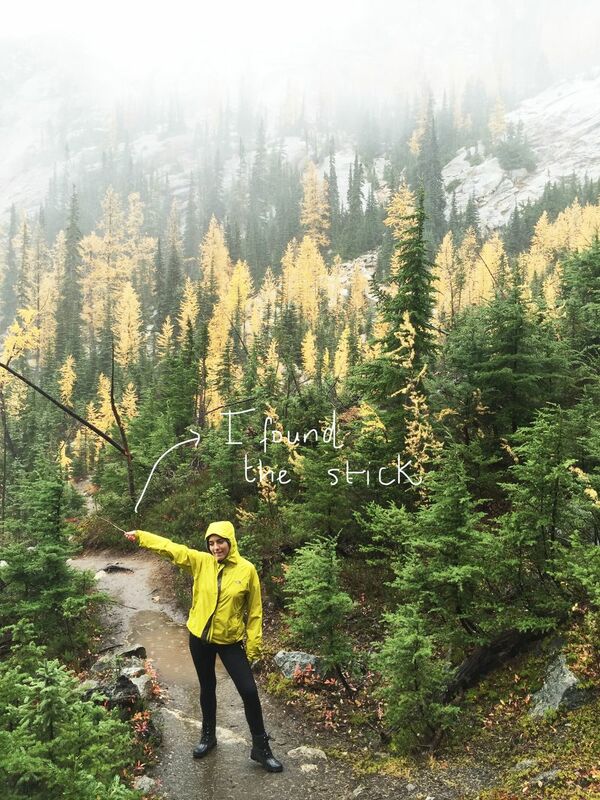 2 hours hiking under thick rain is no joke. I have to say it was beautiful, the air felt fresh and the fall colors were AMAZING. The second night we had a reservation at Sun Mountain Lodge in Winthrop, WA. We checked in mid afternoon and warmed up and went down to downtown Winthrop, a very cute little western town, to grab a drink and walk around before dinner. On Sunday morning, we went to the Hot Tub at the lodge. We all agreed it was one of the best experiences of the whole trip. 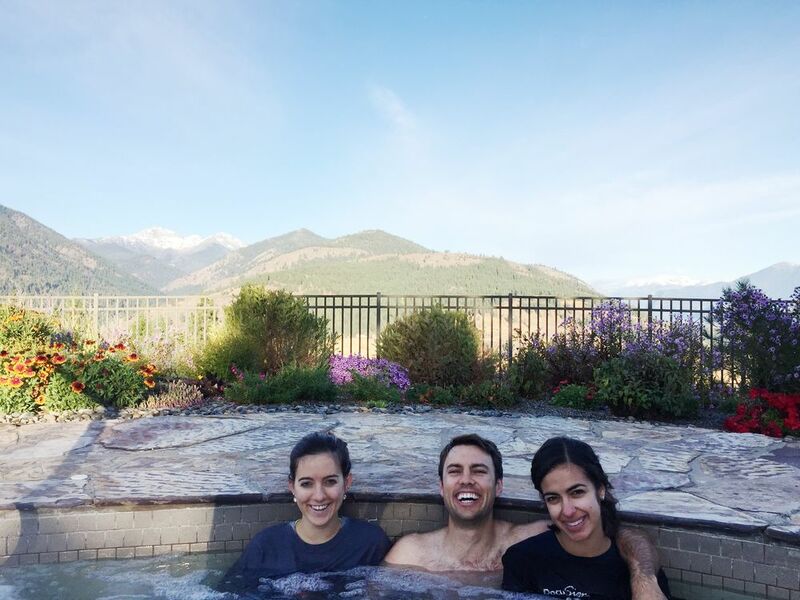 The tub is located with 360º mountain views and we were surrounded by pretty flowers. We stayed there for about two hours, and we left just in time before our fingers were about to decompose. On our way back to our room we saw deer!!! The drive back was so beautiful and the day turned out to be really nice, we stopped along the way to enjoy the beauty of these mountains, the fresh air and the beautiful fall colors. This was a memorable trip, with great company, the views were fantastic and the Mitsubishi Outlander 2015 (Cherry Red) was a great addition to our adventure. It was really comfortable to drive, the audio system of the car was great and allowed us to have our 'karaoke-sing along' sessions for the long drives. One of our favorite things about this car was the open moonroof that gave us additional great views of all the overwhelmingly beautiful views of the North Cascades. We are going back! I want to thank Mitsubishi and DriveShopUsa for making this trip possible and to Carey, Elena and Ryan James for coming along for this adventure! Elena says; "Our cherry red Mitsubishi was the perfect car for our weekend getaway in the North Cascades of Washington. The seats were very comfortable during the long drives and occasional naps. The back seat area was very spacious for two people, and we even had space for additional bags. We loved using the built in bluetooth to play our favorite songs from our mobile devices. Overall, this is a wonderful vehicle to use for road trips!" Ryan says; "The car was fun, it felt clean comfortable and well equipped for everything that we wanted to do, which for me was play media via the Bluetooth speakers system. The car felt spacious and over the course of 5 plus hours in it I was neither sore or uncomfortable. The moon roof also added to my enjoyment driving through the north cascade mountain range."